I hate to fly. It terrifies me. Always has. I haven’t been on a commercial airliner since September 8, 2001, when I ended up stuck in DC over 9/11. My friend Jeff finally persuaded me to go for a ride with him in his little two-seater out of the Crawford airport a few years ago, and last week I was again grateful that he had. 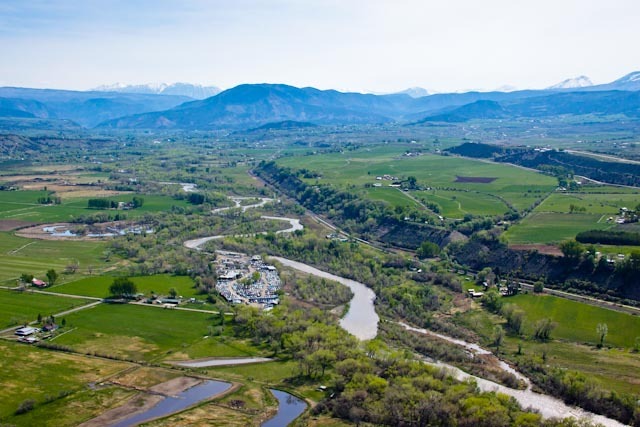 Having survived that excursion, I wasn’t too scared to accept the invitation when I was offered the opportunity to photograph the North Fork Valley from the air on an EcoFlight survey. I sat behind the pilot, Bruce Gordon, and shared the cabin with four other concerned community members, Ty Gillespie from Azura Cellars and Gallery, Jim Brett of Slow Food Western Slope, Sarah Sauter from the Conservation Center, and Marty Durlin with KVNF Public Radio. The goal was to show people the intricacy of the interweave of Bureau of Land Management public lands with our farms, schools, watersheds, neighborhoods and livelihoods, in hopes of spurring people to protect our quality of life by throwing their support behind the North Fork Alternative Plan. 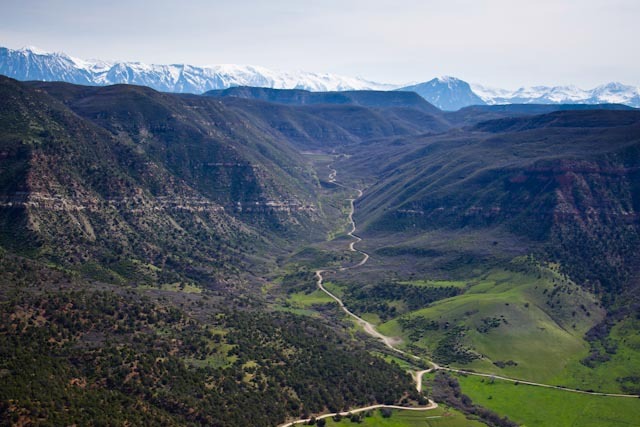 This community-based proposal presents recommendations for the BLM to incorporate into its revised management plan for the region, expected sometime this year. The Conservation Center and Citizens for a Healthy Community collaborated with input from valley residents over the past several months to craft this management plan, with the objectives of safeguarding existing and emerging economies (such as agritourism), supporting community and culture, and protecting natural resources and wildlife. It is hoped that with strong community support behind this plan, the BLM will see their way clear to adopt it as the official vision for moving forward in the next twenty years. You can view and vote your support for this plan here. The flight had a surprising effect on me. I fretted a little over the weekend before the flight, recognizing my fear and meditating on it and, thankfully, coming to terms with it. Monday morning I steeled myself and drove to the Paonia airport. Even before I got in the plane, there was no more fear, nothing but function left in me. We clambered into the plane, and takeoff was so smooth I couldn’t be sure for a few seconds if we were on or off the ground. In the air I became an extension of the camera, taking pictures steadily. Occasionally Bruce would open the window and I could stretch the lens, my hands, just a little way into the wild air, bracing against the wind and the plane’s vibration. At one point Bruce turned sideways and aimed his camera out the window; a fleeting fear in me said, wait a minute, aren’t you supposed to be flying this thing? But I knew he knew what he was doing, and besides, there’s nothing to hit up there. Bruce has been flying to protect America’s public lands for 30 years, and in 2002 he founded EcoFlight, “to provide the unique aerial perspective to conservation work.” They’ve won many conservation awards, including recognition in 2010 for protecting the Greater Yellowstone ecosystem, and the Conservation Hero Award in 2012 from Colorado Environmental Coalition. EcoFlight collaborates with nearly 100 conservation groups ranging from international powerhouses like The Nature Conservancy, Earthjustice, and Audubon to local and regional grassroots organizations, all striving to protect some part of our fragile planet. With a stellar lineup of staff and board members bringing experience from around the world in fields from land management to documentary filmmaking, mountaineering to education, EcoFlight’s mission is to inspire a stewardship ethic and encourage citizens to take action on behalf of the natural world. The images and videos on their website are stunning. 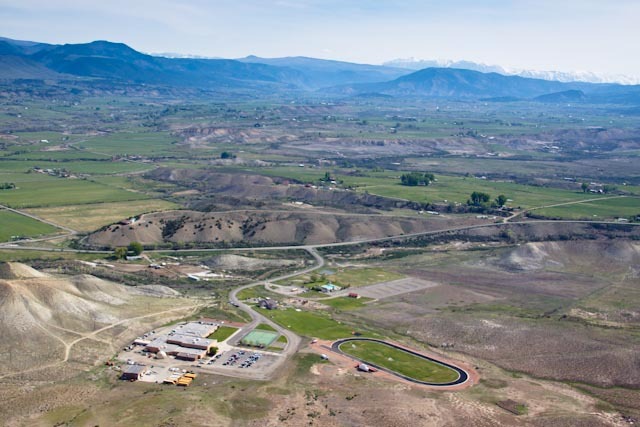 Their flight calendar for May included not only our flights over the North Fork Valley but three other projects in Colorado, three in Arizona, one in New Mexico, and the Bakken Fields in North Dakota. Since 2002, they’ve flown projects in fifteen states (and Belize) ranging over half the land in the country. Their archives and their accomplishments are mind-boggling. Riding in the plane I wasn’t thinking about any of that. I was glued to the camera, watching the valley fly by below me through the viewfinder. We flew down the North Fork River from Paonia toward Hotchkiss to photograph the BLM parcels surrounding the school/pool complex, across the ‘dobies toward the Smith Fork, up the canyon and around Crawford State Park, along the mountains for a peek up Minnesota Creek, and back over Paonia to the airport. It was breathtaking. It was inspiring, breath giving. All lush and bright green with spring rains and snowmelt the fields glowed. The muddy rivers and irrigation canals pumped water through the landscape like the arteries they are. Roads and homesteads, orchards, woods, fields, ponds, all framed by the snowcapped blue mountains. It was there, in the plane, that it hit me: I was finally home. I had been away from home on a long journey since January, and just returned a couple of weeks before the flight. I left home when everything was dormant, the valley’s agriculture underground, bears in their dens, the very water holed up in the mountains. It was a deep freeze when I drove away and my feelings for home were dormant also. Our valley was in limbo, awaiting a decision from the BLM about whether to inflict industrial drilling on us. I spent the spring thousands of miles from home in every way; my emotional focus, my intention in life, and all my attention were immersed in a wholly different world back east, in a small town along the Chesapeake Bay, ecologically so different as well. I felt kind of alien coming back, and it was a challenging reentry. Full-on spring arrived here the same time I did; I was overwhelmed by weeds and catching up, and I was exhausted. Then I had the opportunity to give myself a big stretch, and go up in this airplane to fly over home sweet home. The beauty and the joy of flying over the valley in spring! All the green, the farmlands, the ponds all full, the valley so full of beginning. Through the camera I melded with the plane, matching my position and my shots to the angle of the wings, steadying my lens through the vibrations, forgetting myself as separate. In flight I became one with the landscape below, with the valley, with the moment, feeling life emerging, feeling the love that had lain dormant for my home reviving. It was the fastest half hour I’ve spent in a long time. And feeling, when all was said and done and we’d landed, finally, ironically, grounded. The flight brought me deeply home in a way that being back for two weeks hadn’t done. I remembered why I live here, why I chose this valley twenty-one years ago to land in, stop my peregrinations. I remembered why I gave so much of myself last year to the fight to protect this place. I wept on the drive home, full of gratitude and love, and a profound sense of belonging. Listen to KVNF’s story here. 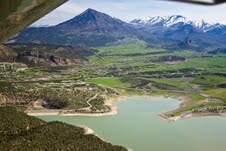 ECOFLIGHT North Fork Valley Colorado from Hutman Media on Vimeo.